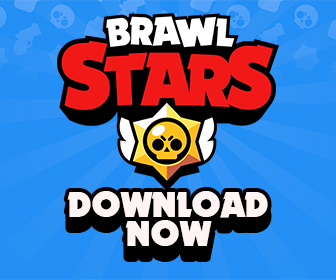 Gene Guide: Basic Stats, Best Tips and Strategies | Brawl Stars UP! Star Power: Magic PuffsGene heals all friendly Brawlers around him for 100 health per second. Gene shoots a solid ball of magical smoke from his lamp. If the ball doesn’t hit a target, it splits up and spreads the damage in a cone. Gene needs 4 complete hits to fully charge his Super. Basic attack deals 1000 base damage if it hits the target. If it doesn’t, each spark deals 166 damage. Special skill has the 2x the range of his attack minus the sparks. For Gene’s attack, he shoots out a Fireball with the potential to deal 1,400 damage to a single target. He can take out Barley, Brock, Colt, Crow, Dynamike, Piper, Ricochet and Spike in only 3 hits. These are the Brawlers he’s gonna be able to really target using his super pulling them in and insta killing them with the regular attacks. His regular attack has potential to reach 5.6 tiles before then splitting up into six little flames that travel an additional 5.3 tiles. This gives Gene a total range of 11 tiles, which is 0.3 tiles further than Brock’s attack! This actually makes Gene attack range the second longest in the game, only out-ranged by Spike when he is actually perfectly in line with his shots. Now for that spread, after it actually reaches that initial, range I like to think of it being very similar to Frank’s attack but basically Gene being able to attack from a safe 5 additional tiles away. This actually allows Gene to attack from around walls at a very safe distance. Each flame individually, once it does burst out, deals 233.3 damage which is not much by itself. 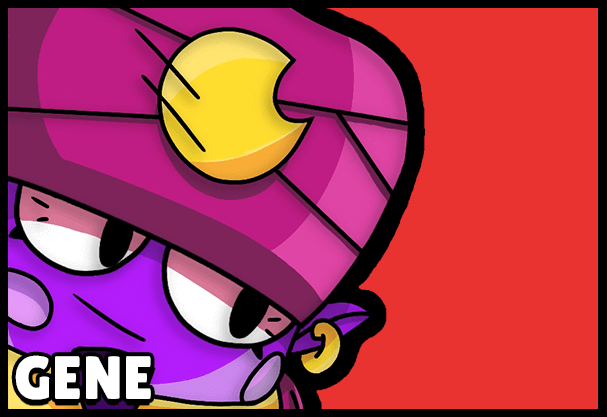 It is very important to remember that he can take out the following brawlers in only 3 hits: Barley, Brock, Colt, Crow, Dynamike, Piper, Ricochet and Spike. These the brawlers that he wants to target using his Super pulling them in and instantly killing them because they’re so closely he can just BAM his regular attack! And this table shows how many complete shots it’s going to take for every Brawler to take Gene out! For Gene’s Super, he shoots out a fist that will grab one target and pull them into Gene’s current location. Because it pulls towards Gene’s actual location that means that if Gene moves, it will actually change the range at which the brawler will be pulled. The super also deals 420 damage upon impact, which is the same as one Bullet from Colt. It is not very impressive at all that damage is like nothing but the pull is game-changing. His super range is 9 tiles. It does not pick up items such as Gems or Power-cubes. If used against a box, a Heist Safe or a Turret, it will deal damage to it but it will not pull. Something very interesting about Gene Super is that the enemy brawler is stunned while they are being pulled but Gene is not. He is still able to actually unload shots and that means that at max pulling range he can actually fire off a couple of quick attacks before they can fire back. This can give him an unload speed advantage. His super can stop supers and attacks. and that normally take a while to unload like Frank’s Rico’s Colt’s Pam’s and it can also knock the ball out of a brawler’s possession . For Gene’s Super, to be fully charged up, it takes 24 of the tiny flames that burst out and split up. With 6 flames per attack, that means he actually needs 4 complete attacks to charge up his super. Typically Gene will be attacking from a long distance away, which means that it can take a very long time for him to charge up his Super. He heals friendly brawlers within a 4-tile radius around him for 100 HP per second. It will not heal himself, which means that only his teammates will actually benefit. I think that his Star Power is definitely one the best. Comparing to Pam’s, Pam’s Star Power heals 129 HP per hit. Assuming she lands complete hits, which she rarely does, Gene’s Star Power heals teammates for 100 healing per second and for reference, both Pam’s and Gene’s Star Powers have a four tile radius. Pam’s Star Power will also heal herself while Gene’s will only heal teammates and because she oftentimes does not actually hit all of her cogs on to a single enemy, this means that Gene star power will offer more consistent healing for teammates. On top of that, Pam Star Power requires the enemy brawlers to be within range for her to heal while Gene can just do it passively without wasting any of his shots. For these reason, I think that his star power is very strong. 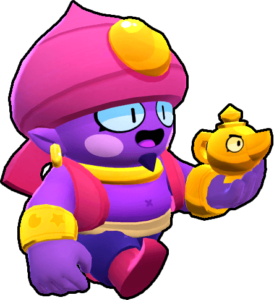 Reload Speed: His total reload speed including the animation time that it takes for him to actually attack is 2.3 seconds, which is the same as Barley, Tara, Penny and Spike. Movement Speed: Gene’s movement speed is slow like the majority of the brawlers in the game. Attack power is Gene’s lowest ranking stat but his range is his biggest strength, which is a huge thing that you want to take advantage of. He has an average walk speed. His HP is mid-range but he actually has the highest HP out of all of the long-range brawlers. His super charge rate is relatively low especially when you consider the fact that his attacks do not pierce, and that he will be attacking from a distance a lot of the time. His reload speed is average. Combining his attack damage and his reload speed together, he has a damage per second of 666 which is almost identical to Nita’s. I think the Gene is very strong. He definitely has his weaknesses like the fact that his super deals almost no damage but a skilled Gene is gonna be very tough to beat. He’s got the DPS and HP of Nita, the control of Poco and the range of Brock. He can attack around walls like Spike. He pulls people across the map like Tara and he can passively heal teammates similar to Pam.